“It’s important for young photographers to create their unique style; their own look. People try to follow the lead of other photographers and it’s so difficult to create something new,” says Greg Gorman, celebrated celebrity photographer. He offers good advice because he himself has risen to an almost exalted status in the starry world of Hollywood portrait photography. And, it’s been a heck of a life’s journey to his new exhibit, Greg Gorman: A Distinct Vision 1970-2010, a 200 piece retrospective exhibition of four decades of photography that has debuted very recently at the Decorative Arts Center in Houston, running from April 27 through June 3. This not-to-miss opportunity showcases Gorman’s illustrious and varied career and really chronicles not only his successes, but also his myriad subjects. When I caught up with Gorman recently, he was in a terrific mood. “I had no preconceived notions about Houston since I had never been here before, and I am having a blast. Wow. I even went bass fishing this morning at a nearby private lake,” Gorman offers. Gorman may not have had exposure to Houston, or Dallas, for that matter, but he has friends in other major Texas cities including Austin and San Antonio. These days, it appears, Houston and Texas has welcomed him with open arms, along with his show. That sense of heart and spirit can be seen in photographs from even Gorman’s earliest work. 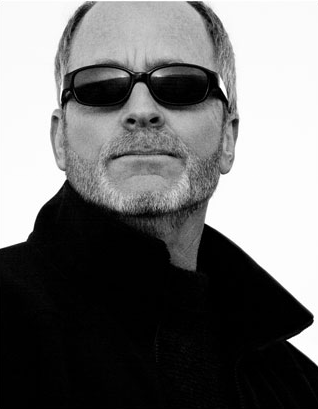 In fact, you’d think that Gorman has photographed every famous actor, or at least most of them including Ben Affleck, Alec Baldwin, Antonio Banderas, Kim Basinger, Marlon Brando, Pierce Brosnan, Kevin Costner, Tom Cruise, Bette Davis, Robert De Niro, Johnny Depp, Leonardo Di Caprio, Andy Garcia, Sir Anthony Hopkins, Dustin Hoffman, Sophia Loren, Al Pacino, Barbra Streisand, Kiera Knightley and John Travolta. And, that’s just a fraction of his repertoire for his youthful age of 62. I remember an Interview magazine in the mid 1980’s where Gorman took the stars of that era and dressed and propped them out as if they were in the 1940’s studio system. It was pure magic that he created with his eye for a lush narrative. Many of them were in his book of photos, Greg Gorman Volume I which sat on my coffee table for years after its release. His work ranges from the artistic to the commercial, yet both are artful, like his advertising campaigns, magazine layouts, and fine art work. Let’s face it, Gorman has climbed to the top of his field and stayed there a long time. But that started in another era. Gorman who now splits his time in Los Angeles, a winery in Mendocino, and his travels teaching around the world, is happy with how his career is being presented in Houston these days. “This is a reinterpretation of a lot of my stuff from the 80’s to early 2000’s,” says Gorman.